For the 12-year-old me, there was nothing more thrilling than an email from R.L. Stine. I devoured his "Goosebumps" books series and developed a fan web site called "The Bumps." It was an obsession -- one that eventually caught Stine's eye. By the middle of 1997, he was actually answering some of my persistent emailed questions, giving me "exclusives" for the site. In December 1997, I quizzed him about the rumors of a "Goosebumps" movie. "I'm going to meet with Tim Burton in January," he responded. The Burton project fell apart. But 18 years later, the "Goosebumps" movie has finally arrived, from director Rob Letterman and star Jack Black. It's on track to be the No. 1 movie in America this weekend. Somewhere along the way, the relationship between Stine and I transformed. Once I was the adoring (and maybe slightly creepy) fan and he was the celebrity. Now, we're friends. Sharing a cab after an interview earlier this week, he showed me pictures of his grandson and we shared stories about our wives. It was a pinch-me moment. So how'd it happen? I suppose he wrote his way into my life with "Goosebumps," and I wrote my way into his. In the very early days of the World Wide Web, in 1995 and 1996, I taught myself HTML -- the programming language for web pages -- by peeking at the source code of sites I liked. It was trial and error. I posted my first page, called "The Bumps," in April 1996. 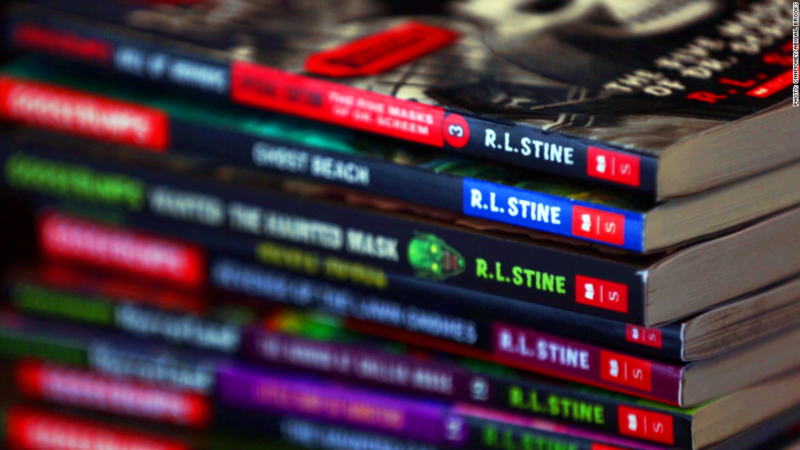 By then Stine had already written 43 "Goosebumps" books. He was churning them out at a rate of one a month, trying to keep up with sensational demand, something never seen before in children's books and not seen again until the "Harry Potter" craze. I upgraded the site seven months later, this time with its own domain name and logo. I was ecstatic to be scoring 50 page views a day. Two weeks in, I published a thank you list, which included shout-outs to Stine, my grandfather ("for the computer"), and my parents ("for the Internet connection"). A reader asked me where I found the time to update the site, and I replied that I jumped on the computer right after school. "Sorry about the late update today," I wrote, "we got snow and I had to go and play!" I'm half embarrassed to be sharing this nearly two decades later. But the other half of me is proud of it. The site continued to grow and grow, always in response to reader feedback, with chat rooms and polls and interviews. There were other "Goosebumps" fan sites, which meant there were intense rivalries to find out the titles and descriptions of the next books in the series. Along the way Stine discovered "The Bumps" -- neither of us remember exactly how -- and he swears he actually learned things from the site. "You were such an aggressive 12-year-old," he told me when we taped an interview this week. "You would call Stephen Spielberg and say, 'What's happening with the Goosebumps DVD game?' And you would call Scholastic," the series' publisher. "And you interviewed my son." I don't think he was entirely kidding when he said, "You scared me." As any attendee at Comic Con can tell you, fandom can be a scary thing. As "The Bumps" grew in the mid-1990s -- and as I gradually grew out of the "Goosebumps" demo -- the web was bridging the gap between fans and their idols. Before starting the site, I had mailed Stine letters and signed up for Scholastic's offline fan club. Then I was able to send him an email and hope for a response. Nowadays he's just a tweet away. From "Goosebumps" I graduated to Nintendo games -- one of my sites was The Nintendo Project, which mimicked The Drudge Report -- and then Microsoft Xbox games and then cable news. In 2007 when I was hired by The New York Times, Stine started seeing my byline in the paper and looked me up. He wrote, "Now that you're in NY, we probably should meet -- shouldn't we?" I visited him at home on the Upper West Side and learned more about the business behind his "Goosebumps" empire. We've stayed in touch ever since. Once, Scholastic even asked me to interview him at a fan event for Halloween. A few years ago he forwarded me a message from another grownup fan -- a Canadian named Matt Marshall who was trying to reach me. Marshall had operated a competing fan site back in the '90s. "I know we were mortal enemies for a while," Marshall wrote to me, "but our rivalry was a fun part of my childhood." We got back in touch this weekend. "It was such a different age of the internet," Marshall said. "You could make a half decent 'fan' page and become the definitive source of information for something because no 'official' source existed." And thanks to the web I still have traces of it -- and a connection to Stine. He's still writing new "Goosebumps" books, and this fall, he's been helping promote the movie. Sitting with him for the interview, I said that "The Bumps" was a reflection of my passion for his work -- it wasn't journalism exactly, but it was journalistic, at least. "Brian," he said, "this is what you've done all your life."